A sought after South Island offering. Oceanview home with a modern take on West Coast country replete with the warmth of wood is situated on a private 5.24 ac. Upon entry one is greeted with a wall of windows soaring to the overheight wood detailed ceiling.The open flow from the maple kitchen to the living room with its river rock faced fireplace and high end woodstove creates an inviting space for entertaining friends and family.The custom wood staircase leads to the private owners' retreat complete with a cozy library. Options abound with this home design. 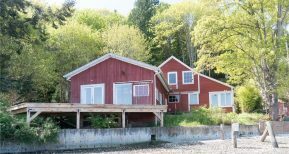 The daylight lower level can be utilized as a self-contained one bedroom suite, with its own woodstove and oceanview deck.Rounding out the main level is a den with additional ensuite bedroom with private entrance - B&B? The versatile property is a mixture of forest, large veg & fruit garden, grazing fields, is fenced and has 36x36 barn with heated workshop, stables, tack room and hay loft.Zoned for guest cottage. Custom craftsman style home with fantastic views of ocean, islands & sunsets. Enjoy a warm south west exposure, surrounded by the quality workmanship & creativity of a builder's own home. Main floor is designed for one level living, with ample room for family or guests in 2 bedrooms on upper floor. A tasteful blending of traditional & casual elements is highlighted by fir plank flooring, wood beams, built-in cabinets, wainscoting and river rock fireplace. The generous kitchen features a farmhouse inspired island, hutch and over-size sink, with an adjoining sitting area warmed by a wood stove and a pantry with storage and bar. A spacious dining room is oriented to sunsets & connects to covered decks for bbq, dining, & relaxing. Owner's suite features bow window with views, 2 closets, claw-foot bathtub and a separate shower room. Other great features: Japanese garden with koi pond, wood paneled office, European-inspired wine room, workshop, 2 car garage & endless extra storage. Charming Cusheon lake property. Just over 1/4 acre this south facing property is rare. It is well treed and level. The cottage is older and requires work or replacement. Development permit exemption, Haz mat and environment assessment on file. This could be used as weekender with some work until you are ready to build a new home on the lake. There is an area on the lot across the street that has an easement for a septic system for this property. Artistic flare abounds inside and out. 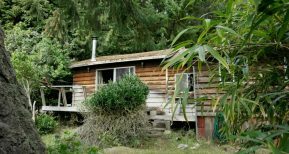 Uniquely constructed eco-friendly cob construction situated on a private ocean view 5 acre property with view of Mt Erskine Park. The construction of this home embraces the true nature of its surroundings and rural setting. The rough, unpolished look accents the natural materials that give the cob home its quirky nature. The main level has concrete floors with hot water heating, galley kitchen with eating area, quaint living room with built in seats, cathedral shaped bay window and a cross-fire masonry heater with built in oven. The upper floor consists of 3 bedrooms, bathroom and flex area. It is finished with rustic wood floors and a vaulted wood ceiling. The property is well treed and has only been cleared around the home. You basically have your own park out your back door allowing for excellent privacy. Zoning allows for a guest cottage, studio and other out buildings. Historic-Artistic-Irreplaceable. Buildings from the 1900's are almost unheard of locally especially with Walk on Waterfront. Originally the Customs House for the Island with stories of bootlegging family members and other adventures. Truly a piece of history! For the last 40 years it's been an artist retreat and oh what a location to be inspired! Acre and a half with seasonal creek and mature woods, privately tucked away yet you can walk the beach to Town. The building is over 3300 ft.² with generous sized rooms, vaulted ceilings and hidden hideaways. The new waterside deck juts out over the water's edge and has spectacular views out over the beach and surrounding marine environment. Two additional small heritage outbuildings. Come and put your imagination to work with the updating needed to take this forward for the next hundred years.